All admirers of this breed know that the American Pit Bull Terrier is capable of some pretty amazing feats. The dogs featured in this article are true canine all-stars, risking their lives to save that of their family and using their intelligence, dedication, obedience and loyal nature to protect those they love. I can only hope that in the same way a few poorly trained, unsocialized Pitbulls are able to stigmatize the entire breed as vicious animals, that featuring a handful of the outstanding pit bull dogs will have the same effect. Enjoy the stories below featuring these pit bull heroes and be sure to spread the word of their good deeds, the more positive Pit Bull press that is out there, the better is for our dogs. 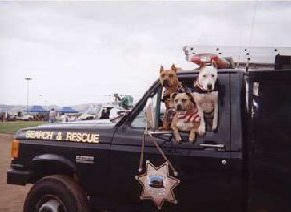 One of the top rated Search and Rescue (SAR) dogs is Dakota, an Am Pit Bull Terrier. Kris Crawford, who has two other pit bulls that are also certified Search and Rescue dogs, owns Dakota. Dakota is so good at what she does that NASA requested Kris and Dakota to assist in the recovery of the Astronauts, after the tragic 2003 shuttle disaster. Kris and Dakota were also involved in the Laci Peterson investigation. Kris and her team have been involved in many cases and have made national news on several occasions. Cheyenne, Dakota and Tahoe, in addition to their work as SAR dogs, are also certified hospital therapy dogs. They can often be seen at pet fairs, shows and schools, informing the public about their work and education about the Pit Bull breed. It is important to Kris to have the girls out educating the public about the true spirit of the Pit Bull and teaching children canine safety, as most fatal dog bite incidents involve children. One day while outside in the yard with one of her “kids”, Weela suddenly body-slammed 11-year-old Gary and sent him flying into the yard. Gary’s mom, Lori, who was watching from the window saw the whole thing and was very surprised. Weela had always played so well with the kids, and she quickly rushed out to see why Weela would have done such a rough move given her usually calm, gentle demeanor. It was then she saw a big rattlesnake sink its fangs into Weela’s face, and she immediately understood Weela had saved Gary’s life by pushing him out of the way! Weela’s good deeds did not stop there, a few years later, Weela saved the lives of 30 people, 29 Dogs, 13 horses and 1 cat. Heavy rains caused a damn to break on the Tijuana River. Weela pulled 30 to 50lb loads of food across the river to a tiny island to feed the stranded animals the entire month they were there. One night two armed men broke into Melissa Willis’s home. They pointed a gun at her while her son stood behind her. Weezie, their male pit bull, immediatelycame to the rescue. In addition to growling, barking, snapping and otherwise causing a scene, Weezie placed himself between his family and danger, and with every advance by the men, he pushed his family backwards until they were to the exit. He kept the armed robbers focused on him so his family would be safe. The Number 1 United States Customs Dog is an American Pit Bull Terrier named Popsicle. How did he get that name? He was found during a drug bust in a freezer where he had been left to die after being used as a bait dog for dog fighters. Not soon after his rescue, Popsicle began training at the Canine Enforcement Training Center in Front Royal, VA. He then went on to work at the Pharr and Hidalgo bridges in Texas. While working at the Pharr bridge, Popsicle alerted to drugs in a tractor trailer. It turned out to be a ton and a half of cocaine with a street value of $139,605,000, the largest cocaine seizure in the McAllen area in 10 years. Popsicle later and went to work at the Port of Roma, Tex. While working in Roma, Popsicle made 24 seizures of Marijuana: 12,080 pounds with a street value of $640,000; one cocaine seizure of 148 pounds worth $6,719,200; and two currency seizures with a total value of $65,144. Popsicle and Rudy have done more than work hard detecting drugs, they’ve also made numerous public relations and outreach appearances. Popsicle is a dog who overcame his abusive start in life and had his chance to get back at the crooks. While working at Roma, Popsicle suffered a career ending injury to his knee – an injury that required surgery. Popsicle is now retired and is living a life of leisure at his owner’s home. 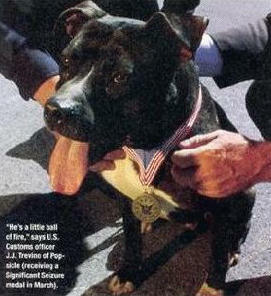 A little over five years ago, Norton’s owners heard of this “loser” dog needing a home, loser because he was a pitbull that ‘wouldn’t fight!’ We had two dogs at the time, a Rottie and an Amstaff, so we weren’t looking for another dog, but something made us call these people to find out about Norton. The owner said thanks but they’d already found a home for him. A week or so later the dog’s owner called back to say Norton was returned and offered for them to come by and take a look. When they went to visit Norton they found a dog with not only physical scars, but extreme separation anxiety. They worked with Norton on this but he refused to not be with his people, these people that loved him, cared for him and took him away from his bad situation, so the owners made peace with the fact that Norton would need to be with them at all times. Little did they know how much this would wind up coming in handy. One evening while in the bathroom, Norton’s owner was bitten by a spider. She was on medication at the time and it inhibited her body from producing any antihistamines, so she went into anaphylactic shock. She couldn’t make it out of the bathroom and could not make a sound to let her husband know she was in trouble. For some unknown reason, Norton got up from his bed in the closet and went over to her sleeping husband and kept pushing him with him nose until Barrie woke up. When her husband saw how upset Norton was and realized his wife was not there, he went looking for her and found her almost unconscious. She spent two days in intensive care and a week at home recovering from a spider bite that would have killed her within a matter of minutes if it were not for Norton. why is it that people constantly harp on the rare pit attacks versus these hero stories!? This is because the media wants people to have a bad view of Pitbulls even though they are loving, caring, and do good things. The media likes to focus on the bad of every situation. Half of the Pit attacks on humans involve humans taunting and provoking them, however it’s not portrayed that way when the story hits the press. As few years ago I was a witness to something horrible, a pitbull attack at least that’s how the story came out on the news. However, being an eye witness I can tell you that the 9 year old girl who got attacked had it coming. She would constantly throw things, poke him with sticks, scream, other things to taunt this dog. Being an ex-fighting dog made him a little more aggravated at taunting such as this. I mean if I was getting taunted like this I would be mean too. 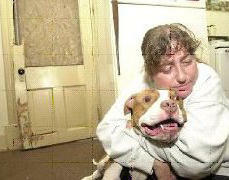 The owner of the dog told the little girl along with her mother to stop because he is a recovering fighting dog. She didn’t listen and the dog took things in his own hands leaving the little girl with scars on her hand. But yet, the media missed this information? More like slandered it out to keep the bad rep going. 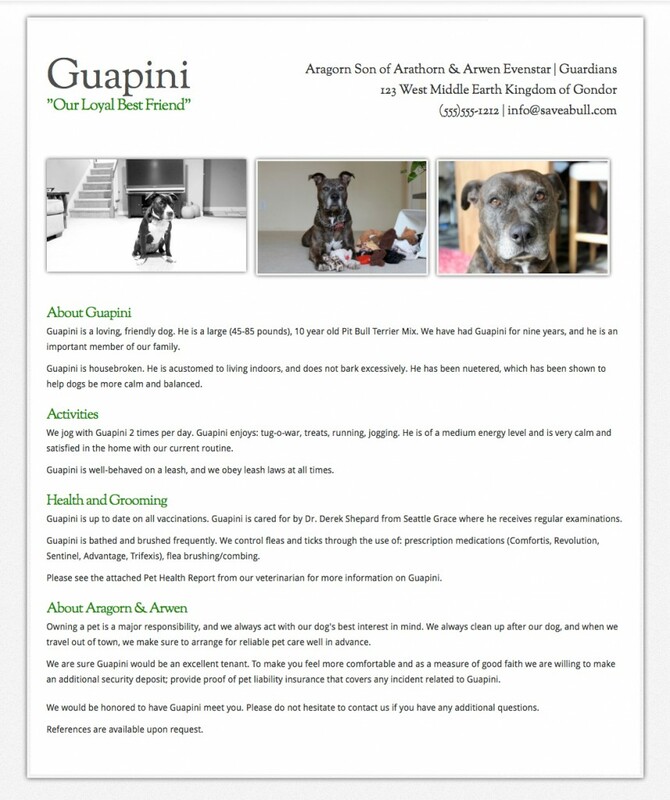 These dogs do amazing things and that is why I support your site and even created my own. Pit Bulls are America’s greatest underdog and I know if people just gave them a chance we could change everything. I couldn’t have said it any better…I have two pitts myself so I support this website 100%..I just wish that ppl would educate themselves more on pitt-bulls instead of discriminating and being abusive..It really upsets me!!!!!!!!!! THANK YOU for this website. I have decades of experience with dogs and have never had one more eager to please than my blue suede bully; I suspect that is why they have been so easy to train to fight. It is ALWAYS the owners, never the breed. These guys are emotionally intelligent, intuitively sensitive, and eager to please. Just as an macho, insensitive cad can ruin his children, so can he ruin a sweet dog. 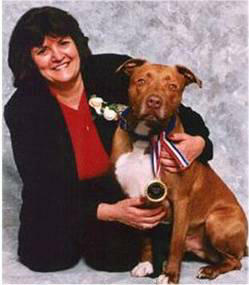 Let’s all get our pit bulls socialized and trained to complete their Canine Good Citizen Certificate! We need more ambassadors of this amazing breed. My family adopted a pit bull in April this year from our local shelter and he is just amazing! The first pit we’ve owned, and definitely not the last! I wish we had a canine good citizenship certificate here in south Africa, maybe then people here would appreciate these dogs more because of their “official” recognition. I had adopted a female pitbull about 3 years old from the NYC Animal Shelter in April in 2012. She is a Lab/Pit Mix and the volunteers at the animal shelter and advocacy groups kept networking for her to find a forever home through ads online, Facebook, Craigslist, and such. I came across her ad on Craigsligt that was posted by one of the animal shelter volunteers. For about 3 weeks my dog stayed in the shelter and everyday dogs get euthanized. Since NYC is full of animals many animals get euthanized and they don’t have enough room for the animals added many dogs are pits or pit mixes. The volunteers worked hard to keep her alive and kept networking. I had seen her ad and immediately adopted the dog. I noticed that my dog enjoyed sniffing everything from grocery bags, clothes, furniture, car tires, and everything. I remembered watching on NBC Nightly News about Popsicle the US Customs dog and I decided to contact US Customs for my dog. I had given pictures and description of my dog and the US Customs Training Supervisor told me to bring her to Front Royal, VA. I had driven with my family about 5 or 6 hours to VA and she was tested, but failed by one factor. I was disappointed that she missed, but was really happy she did well considering it was exactly a month from adoption from the shelter. I was hoping that my dog become the female version of Popsicle busting drug dealers and such. My dog if passed would have either been at Homeland Security US Customs or Department of Justice Alcohol Tobacco Firearm and Explosives Bureau working dog. If my dog passed there would be no question she would have used her eyes, ears, nose, smarts, and all to combat crime. I don’t regret trying her out for US Customs and feel blessed that I have a wonderful dog. My dog was dumped as a stray at the shelter and would have been euthanized, but she was saved not by me, but her wonderful loving Master God. If her Master wants her to try again for US Customs again, I will try her out in Front Royal again. A month ago, I went to a career fair in Maryland and shared my experience of trying my dog for US Customs to Homeland Security recruiters and they they were impressed. They given pins of Homeland Security to me to place on my business attire, but I put one pin on my dog’s harness. She is definitely a special girl and I am proud of her. I grew up remembering the Sport Illustrated cover showing two aggressive pitbulls fighting and how horrible and evil the breed was. So up until my adult life that’s how I felt about them and don’t recall ever meeting or seeing one. My brother in law got one, but he couldn’t keep her because of his landlord. Seeing my wife and I owned a house, big fenced in yard, he asked us to “Watch her” for about 2 weeks or until he found a place that would allow her. I was really upset my wife said yes without really asking me. I remember coming home for lunch to meet this evil beast and fell in love with her instantly. She jumped up and licked me and wouldn’t leave my side. About 2 days later my brother in law called and said he couldn’t find a place and wanted to stay where he was. Could we keep the dog? HELL YES! She was great with people, other animals (we also owned a cat and a german shepherd (for two years while a friend traveled the country) and not ONE issue. I was about 10 feet from them both when our dog jumped at my daughter and began “walking her from where she stood”. Just enough my daughter didn’t fall, but was off balance. Then our dog laid on the ground and began shaking as if to plant herself well into the grass/dirt? It’s then I noticed a slew of hornets flying around. I grabbed my daughter and walked towards our house out of the way. Our dog continued to lay there even when I called her which was not like her. The second I went inside and put my daughter in her playpen, I saw our dog through the window get up and begin scratching and kicking dirt where she was laying. Seeing my daughter was in a safe place and ok, I went outside and called for my dog. She came immediately, mouth open almost smiling as usual, all peppy like nothing happened. Before bringing her in I checked her out. On her stomach was about 10 or so stings on her. Thankfully my wife came home a couple minutes later and I took our pet to the vets just down the street. They told me she was fine and the wounds didn’t even bother her. Later on I went over to where the bees/hornets had their nest in the ground. Turned out it was huge. In fact, for the next two days I could actually see them buzzing around and going inside from our my window. There must have been hundreds. My “evil” pitbull saved our daughter’s life. I absolutely love your story. Thank you for sharing. I can tell you that being my family owned dogs of all breeds, purebreds and mixed breeds that were either found as strays or given to my family, it is not always the animal but the owner of the animal that makes them the way they if the owner has a horse that is drugged and beaten then the horse is gonna act psycho and kill its owner and not on purpose but defensively. would you rather own a 6 month old Labrador retriever with a history of biting people and other animals or a 12 year old Rottweiler whose only bitten its owner one time n those 12 years? its not the dog’s fault or any animal for that matter because it is defending itself. look at Michael Vick whose saying he wants to get another dog for his kids. and the judge after convicting with dogfighting and animal cruelty said for him no more dogs what the heck is wrong with him?